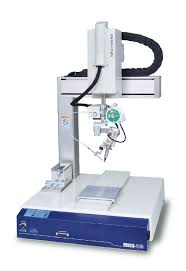 【JAPAN UNIX】UNIX-410Sシリーズ | Products （Soldering Robot ）| MASS CO., LTD. The premium model that achieves fast, precise, and high-quality soldering operation. Offering two slim types of high performance soldering robots that letting our customers choose the best one to fit their objectives. Both come with a clean cut feeder and lock-on mechanism, which are the most popular automatic option, for higher precise works. The model is excellent for durability and repeatability that achieves in cellular manufacturing. In addition, UNIX-410S has mounted “Kaizen” and “Poka Yoke” functions to maintain output quality and the speed of production.